April is in full swing and the warm breezes are making it official that Spring is here! We’ve got some great things going on this month, and luckily, they all come in 3’s! Don’t miss out on the following events and information. 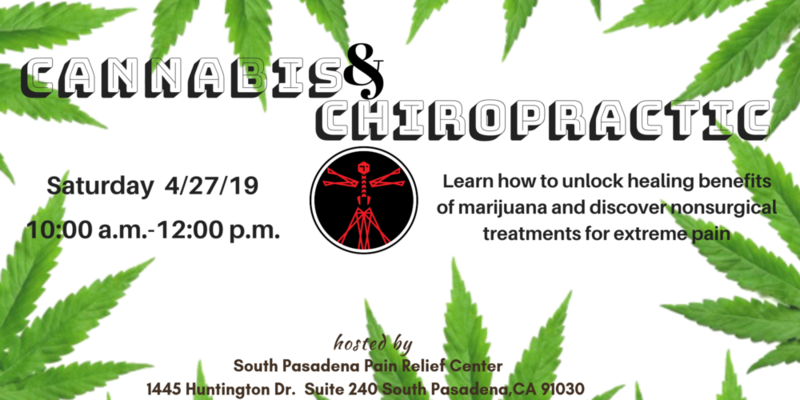 Saturday, April 27, 2019 10:00 a.m.- 12:00 p.m.
Part 1: Cannabis 101- Deconstruct the negative myths of marijuana and unlock its healing benefits towards treating pain. This will be an interactive informational lecture. Bring a notebook and prepare to take notes! Part 2: Non-Surgical Pain Relief -Learn how to eliminate pain for good and maintain back health without surgery or other invasive procedures. Just because our feet are the farthest from our range of vision does not mean we neglect its importance. In fact, an average adult walks about approximately 100,000 miles in their lifetime. Along with our spine, our feet are essential in keeping us mobile and independent to do all the things we need to do in a given day. If a minor or major injury occurs, we are not only affected physically, but mentally, and economically.Unfortunately, the most common foot injuries occur with women due to the constant wearing of high heels. Check out my blog on foot health and the science behind high heels and back pain. Also, please share this article widely to your family and friends who are suffering from foot and back pain! Access the article from the link below. The Art of Shiho Nakaza: Art Exhibit & Sale! We hope that you enjoy these 2 resources for preventing pain and a slice of LA culture and art! If you do, please share them widely with your loved ones! At South Pasadena Pain Relief Center, we truly believe that the more informed our patients are, the faster their recovery will be.